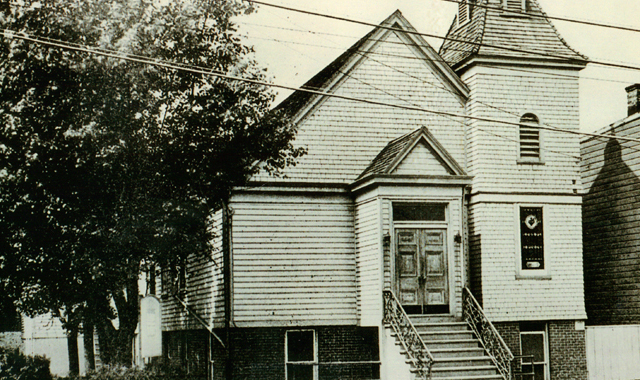 On May 10, 1908, a Catholic mission was established in Secaucus by Right Reverend JohnJ. O’Connor, Bishop of the Diocese of Newark, authorized by Rev. Roger McGinley who was then Rector of St. Brigit’s Church in North Bergen. The mission was established in a dance hall adjoining saloon known as Claredon Hall. This was the first place a Holy Mass was celebrated on May 17, 1908. Not deeming this hall suitable for the Holy Mass, permission was granted by the local Board of Education to use one of the classrooms in a public school located at the corner of Center Avenue and Fifth Street. In the meantime, a certificate of incorporation was filed with the County Clerk of Hudson County under the title of The Church of the Immaculate Conception. The Corporate body was comprised of the Most Reverend John J. O’Connor, D.D, Bishop of Newark, Rev. Msgr. John A. Sheppard, Vicar General Rev. Roger McGinley, Adam Zengel and Richard Starkey. Two lots were purchased on the south side of Paterson Plank Road and on Sunday, May20, 1908, the cornerstone of the first church was laid by Rev. Msgr. Charles Kelly of Our Lady of Grace Church, Hoboken, assisted by Rev. John Ryan, Rev. William Brothers, Rev. Matthew Farley and Rev. George Fitzpatrick. No time or labor was lost to complete the church and on March 7, 1909 the church was dedicated by the Most Rev. John J. O’Connor, assisted by many visiting clergy. Finally, the dream of the many Catholics of Secaucus was at last a reality. In March 1910, Bishop O’Connor appointed the first resident pastor of the Church of the Immaculate Conception in Secaucus, Rev. Charles F. Marshall, former assistant at St. Peter’s Church on Belmont Avenue in Newark. Fr. Marshall served the people of Secaucus until the day of his death on September 28, 1917. During his time as pastor, the need for a rectory was evident as Fr. Marshall had boarded with parishioners during his tenure. Â In 1914, permission was obtained to build a rectory adjoining the church. The rectory was completed within six months and on June 15, 1914 the new rectory was blessed and occupied. The rectory was situated on Post Place immediately behind the church. In October of 1917, Rev. Alois Auth became the new pastor and served for 8 years until his transfer to St. Nicholas Church, Jersey City, in April 1925. During the time that Fr. Auth served as pastor, land situated on Paterson Plank Road between John Street and Post Place was purchased from the Post Estate and as the present rectory. Rev. James Hobson succeeded Fr. Auth yet within few months he was transferred to a new assignment. Rev. 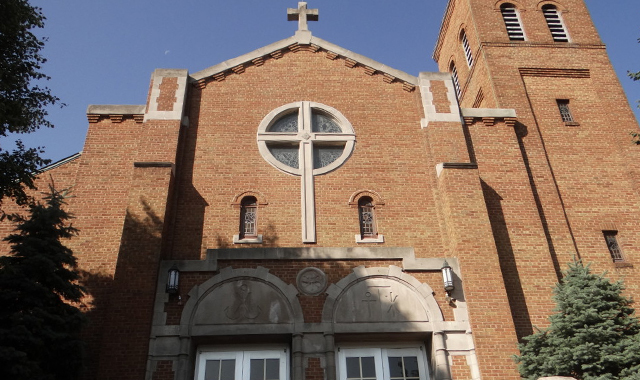 John J. Gormley succeeded as pastor in November of 1925 and during his nine years tenure built an addition to the church which doubled its seating capacity. In December 1934, Rev. Walter A. Hennesey was appointed to succeed Fr. Gormley. During his nine years, Fr. Hennesey purchased 7 lots behind the rectory facing Center Avenue between Post Place and John Street. On December 1, 1943 Rev. Patrick A. Kelly, succeeded Fr. Hennesey. Realizing the need for a parish school and a new church, since the original wooden structure was beyond repair, Fr. Kelly obtained permission for a fund drive to secure the necessary money to begin the mammoth task of building a new church structure suitable for divine worship. In February 1946, approval was granted for the construction of a new church and school building. On August 27, 1949 the new church and the school were dedicated in thepresence of the Archbishop of Newark, Most Rev. Thomas J. Walsh, D.D. 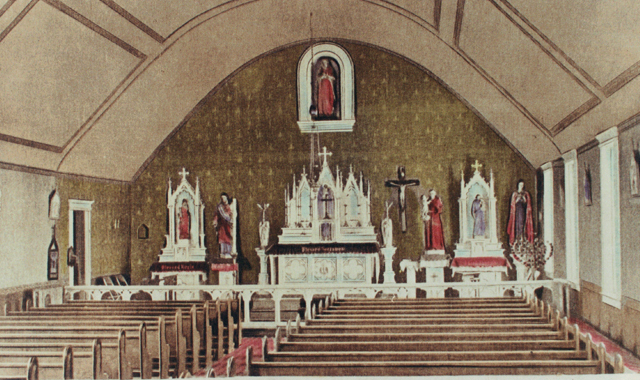 On September 4, 1949, the first mass was offered in the new church by Fr. Reilly, and a formal opening occurred on Saturday, September 17, 1949 with a gala celebration. The needs of a growing town and parish again became evident to Fr. Reilly and so ground was broken for a convent on Monday, June 30, 1952. On the eve of the Feast of the Assumption of Our Lady August 14, 1953 the new convent was completed and the sisters moved into the convent. The convent was the last building that the parish family of Immaculate Conception added to the property. With the convent ready the people of Secaucus fulfilled their dreams. Finally, the dreams and wishes of the founding parishioners were completed. The sisters left the convent in 2003 and the building became the new parish center which is called Notre Dame Hall. In 2008, the parish school also closed and the buildings are been used for religious education. Today, Immaculate Conception Church continues spreading the good message of salvation in the name of Jesus Christ to the people of Secaucus, thanks to the constant support of their faithful parishioners. 1908-1910 Rev. Roger McGinley -First Administrator. 1910-1917 Rev. Charles F. Marshall first resident pastor of the parish.